In the last few days, there have been various announcements in the press about the soon to be aired documentary series by NOVA, which is entitled “The Bible’s Buried Secrets.” This series is supposed to be aired in the US as of November 18th, 2008, and I suppose will be aired in other countries as well. Two seasons ago, the film team spent a day or two at the site during the season, and those of you who were on the team that season may remember them. NOVA has put out a trailer (if this link does not work for you, go to the webpage and open it on your own), which, as all film trailers invariably are, is a bit tacky, but if you watch it and you are quick, you can see a few spots which were taken at Tell es-Safi/Gath. 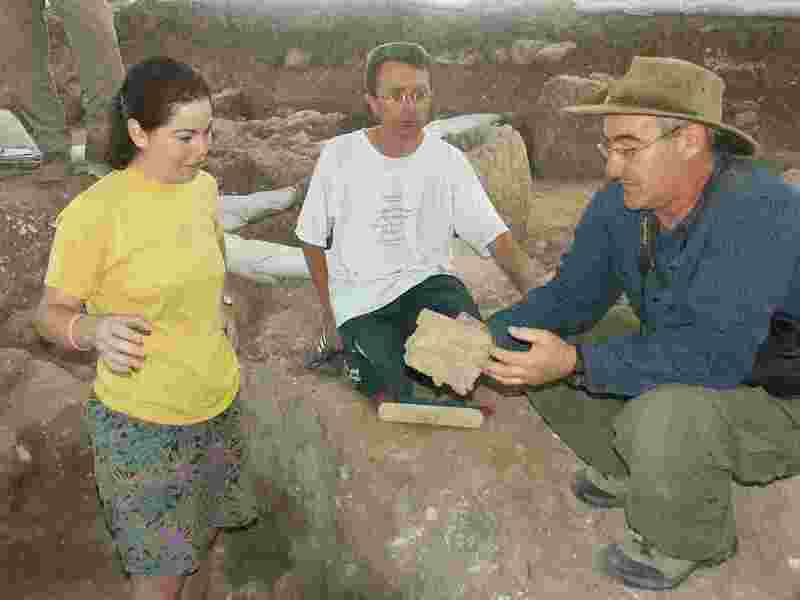 Most obvious is a quick shot of our team member Linda Meiberg (U Penn), who was a square supervisor in Area A that season, who is holding a really nice bichrome Philistine sherd and washing it for the camera. Looks like a very interesting show. Thanks for mentioning it, & for you & your team’s contributions. Looks like it covers all the major finds. I especially liked seeing the first video of the Zayit Abecedary stone. And yes, I saw Linda right after Amihai Mazar discusses the goddess figurine. Perhaps NOVA will air this right after the US elections to give US viewers something else to think about :-) It does sound interesting and I will try to get some of the folk here in Oregon to tune in as an introduction to current archaeology. Nice photo of Linda, Alex and you! Such memories from summer 2008!! Justin Lev-Tov has informed me (via Tristan Barako) that in the TV version of the documentary, all the Philistine related issues have been cut out. They will appear though in the DVD version. The Philistine scene, which is about 10 minutes long and includes footage of Tell es-Safi, will also appear on the NOVA website under “Video Extras” (http://www.pbs.org/wgbh/nova/bible/). Is there any evidence in support of the Exodus? Did it really happen? Ph.D. scientist Gerald E. Aardsma has studied and written on the Exodus for many years. He has some compelling evidence which shows that the Exodus did indeed happen! If you are looking for factual, scientific data, Dr. Aardsma has a book regarding the Exodus that you can order by going to this link: http://www.biblicalchronologist.org/products/Exodus_book.php. fact remarkable for people knowledge, well, keep up the nice work fellows.